In 2010, Tanis Burghardt and Chris Wallace were preparing for the arrival of their second child. As Tanis neared her due date, the couple attended a regularly-scheduled stress test at Victoria General Hospital. The unexpected results of the ultrasound caused immediate concern for the technician, and the obstetrician was called in to speak with the parents. A flurry of phone calls with BC Children’s Hospital made it clear to all involved that the couple’s unborn child was in serious trouble. They were then advised to transfer care to the specialists at BC Children’s Hospital in Vancouver. Without hesitation, Tanis and Chris headed home to quickly pack some essentials and arrange care for their four-year-old son Leighton. Once they arrived at BC Children’s Hospital, both Tanis and her unborn child underwent a battery of tests and consultations. The results of the testing revealed that their child’s kidneys had not developed properly and medical intervention was the only option. 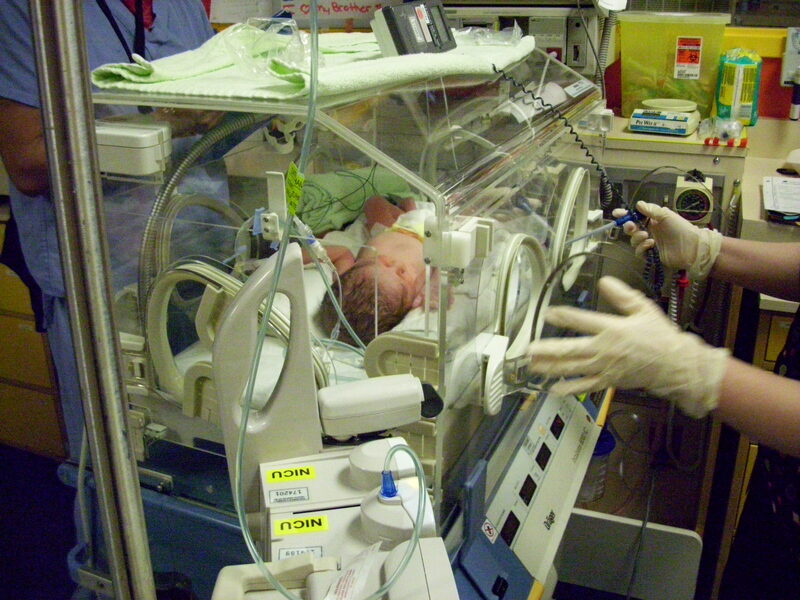 Labour was induced and the medical team was on standby so that they could try to save their child. Three weeks ahead of schedule, Tanis gave birth to their son Coen in a delivery room filled with doctors and nurses. Coen has quickly whisked away to the Pediatric Intensive Care Unit where he was hooked up to numerous tubes and lines to stabilize and monitor his vital signs. Coen was alive, but reality came crashing down on the new parents when the doctor began to explain that their son would inevitably need a kidney transplant. Coen was diagnosed with a condition called bilateral nephrosis which meant that urine would not be able to drain from the kidney into the bladder, and keeping him alive was going to be a difficult battle. As any parent would decide, saving their child was the only option, no matter what the cost. Within less than a week of birth, little Coen had undergone three surgeries and was required to be on dialysis to clean the toxins from his body since his kidneys were not functioning. The severity of Coen’s medical condition required both parents’ full-time attention and returning to work was no longer an option. For weeks on end, Tanis stayed in the hospital, focusing all her attention on baby Coen. Chris travelled between Vancouver and Victoria by ferry as often as possible, both trying to support Tanis and Coen and at the same time trying to be there for Leighton, their four-year-old at home. Chris and Tanis would take shifts staying in Vancouver at the hospital and sharing their time with Leighton back home in Victoria. The battle continued and every day was a challenge to keep Coen alive until he would be big enough to be placed on the transplant list. Coen remained in the Pediatric Intensive Care Unit for three weeks before he could be moved to a regular ward in the hospital. The medical team continued with medical intervention, surgeries, and peritoneal dialysis treatment to combat kidney failure. This treatment uses the lining of one’s abdomen, or belly, to filter the blood inside the body. The road ahead was going to be long, which lead the medical team to train Tanis and Chris to be able to provide Coen with his daily 12-hour dialysis treatments in their home and learn to monitor both the equipment and his status. The weeks turned into months, and before long, almost four months had passed before Coen was stable enough for Tanis to return home to be reunited as a family. When they were finally able to return to Victoria with Coen, what was once their home became an around-the-clock medical clinic complete with a sterilization room to protect Coen from any potential germs that his immunity would not be able to fight. Days and nights revolved around medication feeding, dialysis, and continued monitoring. As months went by, Coen slowly began to grow, but his health continued to decline and the need for a kidney transplant became more apparent. For two long years, keeping Coen alive and stable until he was big enough for a transplant was the only goal. In the spring of 2012, the peritoneal dialysis treatments began to fail which meant that the only option was to return to BC Children’s Hospital in Vancouver to receive hemodialysis which removes the toxins directly from the blood. To keep some semblance of family life, they spent five months travelling by ferry four days a week to provide Coen with the medical care he needed. It became evident that time was running out and Coen would need a transplant soon. Unexpectedly, Tanis and Chris were faced with yet another challenge: neither of them was a donor match for Coen. Once again, reality came crashing down and the only hope was to find a living kidney donor since British Columbia had one of the longest wait times in the country for a deceased kidney donor. In desperation, a call was put out to the community for a living kidney donor to come forward. Over 400 people were tested to see if they could be a possible donor. Even Coen’s aunt returned from Australia to go through the testing process as well, but hope began to fade when she was medically denied to be a living kidney donor. A family friend and RCMP officer, Don Davidson, only learned that it was possible to be a living donor during a family barbeque. Don then made the selfless act to become involved. A father of two young children himself, he immediately began the long process of testing to see if he could become Coen’s living kidney donor. In Don’s heart, something kept telling him that he was going to be a match and it was all going to be OK.
With both parents still required to be off work and resources running out, the financial pressure began to mount. This added additional worry about how they were going to manage financially and continue Coen’s treatments until a kidney donor could be found. The David Foster Foundation came alongside the family to help with the additional costs of travel expenses and household expenses that they were struggling to pay. After several months went by, Coen’s family was thrilled to learn that Don received the medical approval required to donate one of his kidneys to save Coen’s life. Shortly before Christmas, plans were put in place and the transplant was scheduled. Tanis and Chris knew that they were going to be required to stay in Vancouver for several months for post-transplant care. This time, the decision was made to temporarily relocate their entire family to Vancouver. This involved removing Leighton from school to continue his education through programs at the Ronald McDonald House so that they could be together. On February 13th, 2013, Don’s kidney was successfully removed and transplanted into little Coen. The two visited in hospital and continued their recovery. With the financial help of the David Foster Foundation, the family was able to focus on Coen and Leighton and keep their family and marriage together through the stress of it all. The support provided allowed the family to beat the statistic that 85% of families who do not receive assistance end up in bankruptcy or divorce. The family is forever grateful for the financial assistance they received and have no words that could even begin to justify the love that they feel towards Don for saving their son. It is a bond and friendship that the family will cherish forever. Today, Coen no longer requires to be connected to a machine for 12 hours a day. He attends school along with his classmates and can keep up with his big brother. Although he will forever have to do monthly blood work, attend quarterly medical transplant checkups, and continue taking anti-rejection medications, the reality is that Coen will need another kidney transplant one day. For now, the family does not take any day for granted.